Brownells, online at Brownells.com, is the world’s largest supplier of firearm accessories, gun parts, and gunsmithing tools. Brownells guarantees selection, service, and satisfaction to all its customers. Among the huge selection at Brownells are rifle parts, handgun parts, shotgun parts, shooting accessories, gunsmith tools and supplies, optics and mounting, and gun cleaning and chemicals. Brownells even offers a variety of books, magazines, and videos to assist you. So checkout what Brownells has for you. 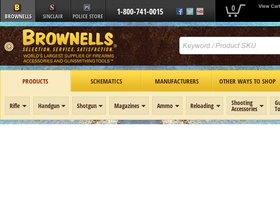 Remember to stop by RetailSteal first to find the best Brownells coupon codes, Brownells discounts, and Brownells promotions. Brownells offers a flat rate shipping price for items shipped to the 48 contiguous states. Methods to select to get this flat rate are UPS Ground, FedEx Ground, or Priority Mail. Other shipping methods are available including 2nd Day Air, Next Day Air, and Saturday Delivery. See website for full details, exclusions may apply. Shop at Brownells and enjoy free shipping on orders 150+. Click here for code. Check out the clearance section at Brownells.com and enjoy up to 80% savings on a wide variety of items. Click link to start shopping. Click link to get your gun cleaning supplies and chemicals from Brownells.com, now up to 40% off. Save up to 35% on Brownells bargains. Click the link to start shopping. Act now and take advantage of up to 20% savings on Remington 700 products from Brownells. Shop at Brownells to save up to 10% or more on their featured products. Click to save. Enjoy $5-$100 rebates on select items from Brownells. Click to shop and save.